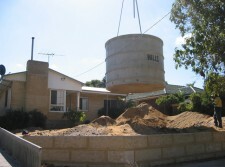 Underground concrete water tanks are a popular choice for both urban households and rural communities. One of the main advantages of these structures is that it can be placed underground and out of sight. In fact, underground water tanks can be partly or completely buried under car parks, gardens or sloping blocks, which means its location can remain discreet and therefore limit access by intruders or passers-by. These structures are completely unobtrusive, almost indestructible and will save resources and money over the long term. Underground concrete tanks are perfect for high fire risk areas as it can withstand high temperatures. In addition, these tanks will not rust, are termite proof, and will keep your rainwater fresh and cool at all times. Best of all – all of our tanks can be installed to suit your individual requirements. 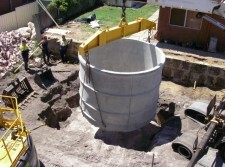 We will take care of the site preparation, deliver your concrete underground water tank to your site and install it. 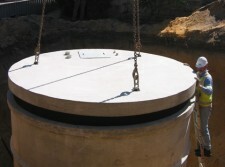 Conserve water and save money with our underground concrete water tanks.